Kasie knows who she’s supposed to be. But one passionate night with a mysterious stranger will teach her who she wants to be. You should sleep with a stranger, her best friend whispers in her ear as they take to Vegas for one last pre-wedding fling. Despite her best intentions, when Kasie Fitzgerald enters the casino and sees him, a man whose tailored clothes belied a powerful, even dangerous, presence, she loses herself to the moment. Maybe it’s the dress, much shorter than she’d ever normally wear, or the Scotch, but something makes her give herself over to him more completely than she's ever done with a man before. It was supposed to be just one night. But right as she’s thinking she wants more, he shows up in her office with an agenda. As the billionaire CEO of a company that’s engaged her PR firm, his demands just became her reality...and he desires so much more than just some attention in the boardroom. 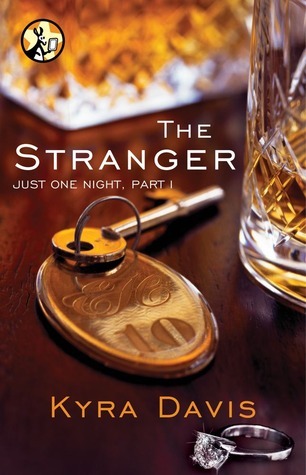 Tempting, seductive and purely romantic, The Stranger is absolutely fantastic! Every moment that Kyra Davis leads readers through is realistic and past the edge of provocative. Just One Night, Part 1 introduces readers to a loose girl bottled up tightly inside the perfect good girl. From showy, skintight designer dress in Las Vegas to ultra-conservative business wear in Los Angeles, Kasie Fitzgerald is a hot and spicy contradiction. The beautiful thing about her contradicting attire is that she's about to discover the inner self that gave in to heated desire with a stranger. What I love about The Stranger is that it's seriously sensual without losing the focus on the main character's real issues. Kasie believes in achieving perfection in every level of her life, personal and secular. She's soon to be engaged to her steady, very steady, boyfriend of six years who drives home the obsessive importance of perfection. Kasie's character unfolds in stages. The outset of the story shows that she's the kind of woman who never does anything out of order. When she decides to go through with the one night stand with Mr. Dade, her perception of herself begins changing. Deeper into the novel, Mr. Dade charges back into Kasie's life and she really begins to explore the free spirit roving about inside of her, looking for an outlet. Her boyfriend, Dave, feels like the complication, the obstacle that keeps her from being herself, but she just can't let him go. Sometimes I didn't know whether to smile with delight or sigh in disappointment when she seriously examines her relationship with Dave, then changes gears when she contemplates letting loose with Dade. The conflicting emotions and desires in Kasie kept me reading and sitting on the edge of my seat. Davis certainly pushes The Stranger to a emotional climax that will leave readers waiting in anticipation for Part 2, Exposed!